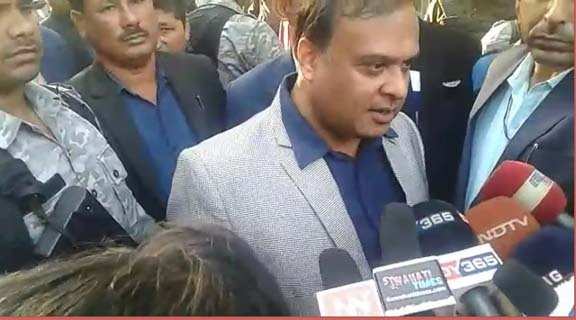 An FIR has been lodged at the Rangiya police station on Tuesday against Assam finance minister Himanta Biswa Sarma for his alleged communal comments. A local resident of Rangiya, one Kanihar Hareswar Barman has filed the FIR against minister Sarma. The minister has been accused of spreading communal hatred through his hate speeches. The FIR is mainly targeted against his statement given to media after a few Krishak Mukti Sangram Samiti (KMSS) and Asom Jatiyabadi Yuba Chatra Parishad (AJYCP) workers waved black flags during minister Sarma’s visit to Kalamoni in Rangiya in Monday. Speaking to Northeast Now, Barman who had filed the FIR said that such statements are not expected from a person like Himanta Biswa Sarma who is holding a responsible position. On the other hand, the office in charge of Rangiya police station has admitted receiving the FIR. He, however, said that no case has been filed till the time of filing of this report. Notably, FIRs and police complaints have earlier been filed on several occasions against minister Sarma. However, it is seen that most often, the Assam Police shows a kind o discomfort and unwillingness in filing a case against the influential minister in the Assam government.